Carlyn Beccia is an illustrator and artist who is inspired by the world of the circus and clowns. She has been painting and performing various acts of circus baboonery since she was a wee young girl. She first tested her own creativity in the human cannonball act by projecting her sister across the room. Her sister had to have stitches, but Carlyn knew she was destined for circus stardom. Carlyn attended the University of Massachusetts on a 4-year art scholarship and graduated in 1995. She has been awarded a number of awards from the Society of Children’s Writers & Illustrators. She lives in Lynnfield, MA with two ferocious cats and her famous Strongman husband. 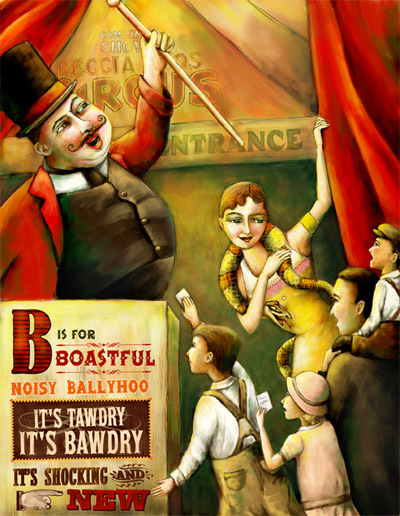 Last year she wrote a fantastically illustrated book called “Who Put the B in Ballyhoo”, which is an ABC book that features the circus and the sideshow. Each of the illustrations is beautifully well done, and is clever and witty. They run the gamut from tigers to acrobats to , yes, a flea circus! This is definitely a book worth having. Carlyn has a website for the book http://www.whoballyhoo.com which features interactive games, a make your own circus poster game, and info about author visits. She has a couple of other sites that are also circus oriented (listed below) In addition to being an illustrator, she is a crack web designer.